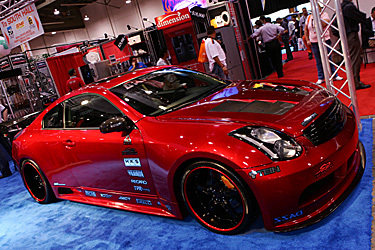 The SEMA show is known as one the biggest automotive aftermarket trade show in the world. Every year at around October to November, this massive event takes place in Las Vegas attracting hundreds and thousands of people. Like every year, the release of new wheel designs has astonished the automotive industry. 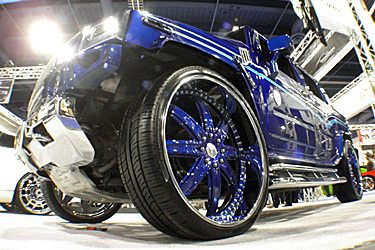 30+ inch SUV wheels were premiered, making the public wonder how big these rims can get in the future. On the sedans, 20 inch plus rims were a general standard, with vehicles easily sporting 22 and 24 inch under the fender wells. In comparison to the years before, the number of the sports compact machines have significantly reduced. 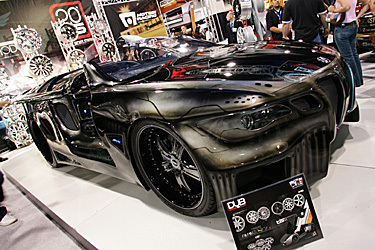 However, a plethora of new trends were still displayed making the SEMA show the hottest event of the year. This 700 horsepower Honda Fit was produced by an aerodynamics kit producer called Extreme Dimensions. The 2.4 liter base was bumped up to 2.6 mated with a Garrett GT35 turbine. The NX nitrous kit exhibited inside the engine bay and the interior were primarily put on to cool the incoming air directed to the intercooler. The entire exterior was designed by Extreme Dimensions. The Element was a popular platform in Japan a few years back. Currently, this vehicle remains popular amongst the America ns because of its versatile capabilities. But who ever thought that it would be a good platform to use for drifting?! The 3.2 liter engine was bolted to a Garrett GT28RS twin turbo for a total output of 500 horses. The gutted interior and the roll cage signify its will to start sliding sideways! APR Performance is wide known for its carbon GT wings and canards as well as the wide body aero kits. The widebody kit for the Infiniti G35 was recently released, naturally enhancing the width of the body without any flamboyancy. The splitters and the GT wing are included inside this kit. APR had also released a widebody kit for the Impreza which is a huge hit. A S200 Borg Warner turbo kit was outfitted on this 2.4 liter 2AZ engine, achieving 300 horsepower. VIS Racing carbon fiber components were installed on the roof and hatchback gate along with an APR carbon GT wing to make up a lightweight body. The interior has been fully gutted as well. HRE 17x8.5J rims were installed front and back. At the American Racing wheel booth, an unearthly machine was spotted. This BMW 6 series coupe looked like a machine that was created from another planet. Mixed with a full line of Alpine monitors and audio equipment, this Bimmer was fitted with American Racing wheels called Tis. 24 inch rollers and 26 for the rear were tucked gracefully inside the wheel wells for that luxurious but intergalactic look. At the Lexani booth, there were more gigantic wheel setups. This Tis wheel was also present at the American Racing booth. For the luxury customization class, 30 inch rims are now the standard size for most SUVs. The flashy grill, crocodile interior, and body color rims were the hottest trend that set the trend for this year. This full on show car literally stopped the crowd with their jaws wide open. A Yaris with some JDM flavor graphics! The racing look was pulled off with the help from wide fenders and an APR carbon GT wing. JBT front and rear 4 pot caliper rotor combo brakes were chosen to accentuate the 19 inch 6061 alloy rims. The hot pink 350Z claimed its ground at the Nissan booth, constructed by BRS. The wideness for the rear was increased dramatically, but could have used bigger sized rims to suit our flavor. US's perception of a drift machine! This 240SX constructed by McKinney Motorsports was outfitted with CWings hood, front rear bumpers, and tail gate. A Garrett GT30R turbo powers this machine. This Honda Fit gave out an urban street image with even a spray paint rack displayed on the rear luggage space. Mugen is one of the most sought after products by the American Honda enthusiasts. This Honda labeled as the Mugen Civic Si, is a limited edition production vehicle which only 500 are planned to be released in 2007. A custom roll cage, Power Enterprise supercharger kit were some of the few goodies installed on this race spec Yaris. Enkei rims and a full Tein suspension is controlled by the EDFC system. The newest style Lexus LS series makes a debut at SEMA. The ACC Air Runner booth sported a LS that was quickly upgraded with a full air suspension a week after its north American release. Called the iST in Japan, this xA represents the US! Looking at this creation, it's difficult to determine how the original form looked like. The entire roof component lifts up with a giant monitor installed beneath. The audio equipment present here was impressive. Falken displayed a clean S13 that stood out without the flashy graphics and expensive paintjob. The S13 was given a later generation S14 fascia with a widebody stance. The carbon fiber components for the front of the vehicle were painted tastefully along with the rear trunk. This gentle, yet sporty creation displayed a sophisticated appeal. The new trend of wheels! The Konig booth displayed this 350Z outfitted with a great looking body kit. The highlight of this vehicle is the wheels which had the capability of the red portion of the rim to be disengaged. Every year, Lexani displays many wheels decorated with diamond crystals. This 30 inch rim was released by Ashanti, which is a sister brand of Lexani. A rim with 2 different sizes?! This GS was displayed at the Giovana booth along with the Hummer. This rim was measured at 18 inches inside however displayed 22 inches on the outer portion. This design is called EFT, and apparently special tires are necessary. Transparency the next big trend?! This rim was created with polycarbonate materials to make up a lightweight construction. The D'Vinci line of rims are still in the testing stages.